Having worked in Turkey for almost seven years, Julie and I experienced the two devastating earthquakes of Turkey. Did you know that Israel is considered to be the centre of the Universe? Biblical history is the history of Israel. It is different from all other histories. Secular scholars consider the movements of nations and armies to be the core of world history Throughout the Bible God has always spoken of Jerusalem as the... EPICENTER! It is remarkable, but the Bible alone views history from the vantage point of Israel, especially from Genesis 12 through Acts 8. The prophet Isaiah, for instance, envisioned Israel as occupying "the centre of the earth": In that day shall Israel be … a blessing in the midst of the earth (Isaiah. 19:24). 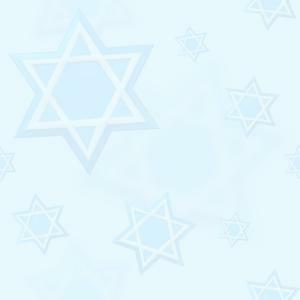 The (YLT) version says: In that day is Israel third, After Egypt, and after Asshur, A blessing in the heart of the earth. Israel, however, was always in the foreground, through the patriarchs, the kings, the prophets, the movements of the nation in and out of the Promised Land, and the various reactions of the Israelis to the first coming of Christ. The nation Israel was always centre stage, and the Bible mentions Gentile nations only insofar as they had contact with the Chosen Nation. Due to the mountains and vast desert to the east of Israel, the main north-south trade route of the ancient world passed right through Israel. It is called the Via Maris (the way of the sea) and stretches from Egypt in the southwest to the great kingdoms of the northwest: Assyria, Babylon and Persia. In the days of the Bible, these kingdoms were far more powerful than tiny Israel and when they weren’t trading with each other, they were fighting for the control of territory. In either case this route was in constant use. The east-west trade route allowed travel from the King’s Highway in Trans Jordan westward over the Jordan River through the Beit Shean Valley to the Mediterranean Sea. Megiddo was a place of great influence because it was located where these two routes crossed. In fact, control of this location could control world trade in the ancient world. Megiddo’s significance is a key to why God chose the land of Canaan for the children of Israel. In fact, one of the best descriptions for Israel could be: The land In-Between. Israel is actually a hinge – like the hinge on a door – between the great regions of the ancient world: Africa to the south, Asia to the east, Europe and Russia to the north, and the great Mediterranean basin to the west. Whoever controlled the land of Israel could exert great influence in the world. That is why conquering Israel was, and still is, a strategic goal of nations seeking to control the Middle East. However, this parcel of land is not up for grabs, because God had, and has a plan for it. This land chosen by God was also selected for a special reason. It is strategically located right smack in the middle of the crossroads of the ancient world with all of its challenges. And this is right where God wanted His people to be. As they say in advertising; location, location, location! God put His people in a place, right where God wanted them for a chosen purpose. At times of war or at times of peace, God’s message would get out to the known world. But why? God could have taken them to the remotest desert of the Middle East and created another Garden of Eden for them. There, they could have just basked in God’s glory and provision, being removed from the conflicts of the world. In fact, out in the driest part of the desert where no one travels, they could have gone unnoticed until this century when our technology and satellites would have finally photographed them from above…… but……. 1. The strategic location of the land would create special pressures. You might call it "God’s testing ground of faith." In this land, there was much pressure and many tests. But, through these tests, with all odds against the Israelites, God showed forth His miracle power to sustain them and bless them, even in difficult situations. That made people - sit up and take notice! 2. Since all communications, trade, and even armies of the ancient world had to pass through this land, the message of God’s relationship to man through His chosen people, the Jews would spread to the known world. The people of Israel were to be a living testimony of God through their lifestyle and message. In times of peace, traders and travelers could see and hear God’s message to take to the world. At times of war, God showed His power to miraculously defend them. This message also went around the world. For example, the great King Sennacherib of Assyria invaded Judah in 701 BC. When he reached Jerusalem, he blockaded the city and mocked King Hezekiah and the God of Israel. God moved! The angel of the Lord killed the soldiers and officers of Sennacherib. 2 Chronicles 32 says that Sennacherib returned back to Assyria in disgrace. Not only is this recorded in the Bible, but Sennacherib left and account of this event chiseled in stone which testifies to what God did on this day in Israel. In order to determine if today’s Israel is located in the same place as biblical Israel, we have to look at the Bible. What "land’ are we talking about? In Genesis 15: 18, we are given the dimensions: "The Lord made a covenant with Abram, saying, ‘to your descendants I have given this land, from the river of Egypt, as far as the great river, the river Euphrates. ‘"
In Exodus 17: 8 it states, "All the land of Canaan. " In Exodus 3:8, God speaks to Moses in the wilderness and tells him: "I have come down to deliver them from the power of the Egyptians, and to bring them up to that land… to a good and spacious land… to a land flowing with milk and honey… to the place of the Canaatie and Hittite and the Amorite and the Perizzite, and the Hivite and the Jebusite." This description comprises today’s Israel, plus part of Jordan, western Syria and most of Lebanon. In Ezekiel 20: 6 we read, "…a land flowing with milk and honey, which is the glory of all lands." Look at tiny, tiny Israel today! Israel is one of the tiniest nations on the face of the earth today. And can be compared to the size of the Kruger National Park in South Africa. Only 1/19th the size of California, Surrounded by 22 hostile Arab Islamic dictatorships with 640 times her size, 60 times her population and ALL the oil. Israel needs you and us. Israel needs Christians to stand with her in her time of need - NOW! Israel: Is The Most Disputed strip of Real Estate on Planet Earth! Arab propagandists call Israel "expansionist" and the "aggressor" against all Arab peoples. For those unfamiliar with the Arab interpretation of "aggressor," it means one who dares fight back against Arab aggression! So even though Israel may have fought only defensive wars, the mere fact that she resisted total destruction is viewed as an "act of aggression." That's a case of wacky logic but, unfortunately, Israel doesn't have the luxury of picking her enemies! Unlike Islam's Koran, which commands Muslims to force the entire planet to submit to the literal control by Islam, the Jewish Torah promises the children of Israel a modest and reasonable allotment of land. How can Israel, which occupies one-sixth of one percent of the lands called Arab, be responsible for the political dissatisfaction of 22 Arab countries? How can the 13 million Jews in the world (almost 6 million fewer than they were in 1939!) be blamed for the problems of the 300 million Arabs, who have brotherly ties to 1.4 billion Muslims worldwide? Consider Joshua, who was called to bring the children of Israel into the Promised Land. Not only was the land promised, but God defined the borders of each tribal area. It is so accurate that you can read the account of this division in the book of Joshua today and trace the borders, valley for valley, and hill for hill, on the modern map of Israel. This was no fairy tale, but God’s provision for His Chosen People and Chosen land. But was it easy for Joshua? Not at all! Starting with Jericho, they had to fight every step of the way to conquer that which God provided for them. Was God in this? Yes, He was! Through it He showed His power to His people and also His enemies. "Nothing is impossible with God. "(Luke 1:37). The key to this passage is that God has the means to make the impossible, possible. As we abide in Him, we can see His victory in our lives too. Jerusalem is the center of the end time conflict! The Jews are forever His chosen people with a chosen divine destiny for the world and any attack against them, be that military or theological, is always an attack against God Himself. The City of Jerusalem is the heart and the unfolding of the events. We are all commanded by the Lord to pray for the peace of Jerusalem; Psalm 122 I was glad when they said to me, "Let us go to the Lord’s house." And now we are here, standing inside the gates of Jerusalem! Jerusalem is a city restored in beautiful order and harmony. This is where the tribes come, the tribes of Israel, to give thanks to the LORD according to his command. Here the kings of Israel sat to judge their people. Pray for the peace of Jerusalem: "May those who love you prosper. May there be peace inside your walls and safety in your palaces." For the sake of my relatives and friends I say to Jerusalem, "Peace be with you!" For the sake of the house of the LORD our God I pray for your prosperity. There are many cities; Johannesburg, London, New York, Istanbul … in the world but God specifically mentions Jerusalem. This is the city God said, "I have chosen Jerusalem to put My Name in that place … the city of God (2 Chronicles). And we that it is a city that is a cup of trembling…! Zechariah 12:2 – 3 "I will make Jerusalem like a cup of wine; the nations around her will drink and stagger like drunks. And when they besiege Jerusalem, the cities of the rest of Judah will also be besieged. But when that time comes, I will make Jerusalem like a heavy stone---any nation that tries to lift it will be hurt. All the nations of the world will join forces to attack her." Let’s go to the Highest Authority, God Himself and see what He has said about Jerusalem. Examine God’s Word about Jerusalem its past heritage, as the city of David; its crisis and future hope. The first time the Bible mentions Jerusalem, it is a Canaanite, Jebusite fortress names Salem. Abraham comes to the City of ancient Jerusalem and there he meets Melchizedek (Gen 14:18) a priest of the God of heaven and returns to the city to Mt. Moriah to sacrifice Isaac until the angel of the Lord tells him to stop. 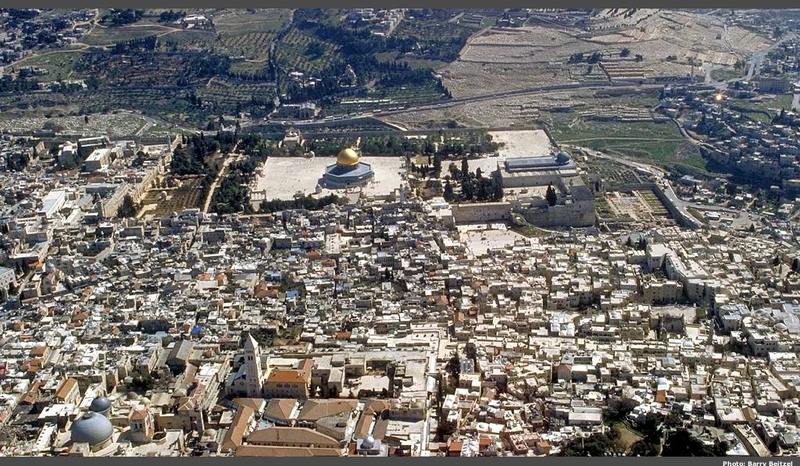 Today the Dome of the Rock stands on that same spot which is a sacred shrine to the Islamic people. As we see Jerusalem: past – City of God; Present – Divided City; future – City of Peace. It is also the place on the outcropping of Golgotha and Mt. Moriah where Yeshua (Jesus) died for the sins of mankind and as the rest of the Old Testament begins to unfold on the City remains under the Canaanites until 996 BC when King David conquered Jerusalem and made it his capital. From that point on Jerusalem is the essential city for the Jewish people. In 586 BC Nebuchadnezzar conquers Jerusalem and burns the city and Solomon’s temple is destroyed. The Jewish people are taken to Babylon for 70 years. Later they return under the Persians (the ancient Iranians) and given opportunity to build a second temple. 515 BC Zerubbabel dedicates the second temple, the same temple that would be there in the time of Christ. By 63 BC the Romans conquered the city and take over all the Middle East. And Herod the Great is King of the Jews. Herod’s temple expands the temple and it’s the same place where Jesus’ parents took him to have him dedicated. At the time of circumcision returns at age 12 for Bar mitzvah and discussed the things of God with the Priest and Pharisees. About AD30 – The triumphant entry! Zechariah 9: 9 "Rejoice greatly, O daughter of Zion; shout, O daughter of Jerusalem; behold, your King comes to you. He is righteous and victorious, meek and riding on a donkey, even on a foal of the donkey. " Zechariah wrote this after the captivity and there is no king at that point, no one from the line of David. He foresees a Messianic promise that is fulfilled in Jesus riding into Jerusalem on Palm Sunday. In our day and age we think of the world in terms of a planet with nearly 200 independent countries on 7 continents. In the ancient world civilization originated in the Mesopotamian region near the Persian Gulf and migrated from there. A great migration developed upon what is known as the "Fertile Crescent," which was like a great arc of cultivable land that extended from the Persian Gulf, up and around Mesopotamia and back down to Israel. By 1000 BC the known world reached as far west as Europe. The major east-west trade routes were established along the Fertile Crescent. Abraham, the first Hebrew actually followed this route from ancient Ur in Mesopotamia, up and around the Fertile Crescent to Haran and down to Israel. When the armies of the east collided with the armies of the west it would happen somewhere along the Fertile Crescent. This brings up an interesting point. Israel was located on the west end of the Fertile Crescent. In order to travel from east to west or north to south one had to pass through Israel. The great kingdoms in the ancient world were Egypt, Babylon, Assyria, Persia, Greece and Rome. They were all, at one time, world governing empires in the known world. What is incredible is that the small country of Israel was located right in the centre of all of them. In fact almost every time they collided it was in the land of Israel. The geography of the Near East forced people who travelled from Egypt to Greece to pass through Israel. To travel from Babylon to Rome meant to pass through Israel and to travel from Persia to Egypt meant to pass through Israel. It is no wonder that Alexander the Great gave respect to the people of Jerusalem and their temple. Israel was intended by the Lord to be a light to the world and it was to them that the Word of God was entrusted. The people of Israel were called the "chosen people" because "through" them God would show His care for the "whole" world. Abraham was made aware of this when he met Melchizedek and the Lord revealed Himself to him by the name "El Elyon" which signified that He was not just the God of the Hebrews but the "Most High" God of all mankind. What a City! What a heritage! The ancient City of God! God would say I’m going to change the course of history in that city. It is in that city that He would challenge Abraham; David to be King; The Temple planted but it is also where judgment would fall on His people. Still God reaches out again, and again! What happened in the past helps us understand a little of what’s going on in the present! The crisis in Jerusalem today – the City of God, divided and often in conflict against itself. God said, "I have chosen this City to be a Holy City, to be My City, and it’s where I would put My Name." From about 1000 BC to AD 70 the Jewish people in Jerusalem were trying to build the Kingdom of God on the earth. For 1000 years it was a Jewish City. Archaeologists discovered some of the remains by as Jesus said "every stone will be turned." God used the Romans to cast down the stones. For centuries the streets lay covered with dirt, but now excavated. The second temple was destroyed by the Roman Army. Jerusalem would then be held by the pagan Romans for the most of the next 300 years until AD 325 when it would become a Christian City under the Emperor Byzantine Empire. Then AD 638 became an Islamic City. It is a City that is divided today; Jewish, Christian and Muslim.For the Jewish the Western Wall as they look for the Messiah, yet to come! For the Christians it is the Garden Tomb which is in the Church of the Sepulcher, awaiting the second coming of Yeshua (Jesus). For the Muslims it is the Dome of the Rock that they dominate awaiting the 12th Imam that will come somewhere in the Middle East and march to Jerusalem. Once again the focus of history is back on Israel. If we are to look at the world the way the Scriptures do, we must now view all actions of all peoples from the vantage point of modern Israel.If the Scriptures are the Word of God, and that we constantly affirm, then we must conclude that this is precisely how God views the world. It is not easy for us to do this because we normally view everything from our own perspective: our family, our country, our church and our culture. How can we lift ourselves out of our shell and our circumscribed mold and begin to view our world from the biblical point of view? It takes considerable effort, concentration and faith to go against the grain and commit our minds to conforming to the scriptural perspective. It is also somewhat humbling, as well. We must step down off this exalted cultural pedestal. We must understand that much of what God will accomplish on the earth between now and the Lord’s Second Coming is going to be done in and through Israel. Jerusalem was, and still is – important to Jesus. He never denounced His Jewish ness and as we can see even in the last book of the Bible, Revelations, that He reconfirms this. Like Israel, we Christians need to be rooted and grounded in the Lord. Like Yeshua (Jesus) we need to love His Branch, His descendents the Jewish people. Do we have any reason to think that the devil is going to take the end of his power due to the restoration of Jerusalem without putting up a fight? One of his major weapons is anti Jewish, replacement theology. With the glorious future for the whole world that is clearly linked to the restoration of the Jewish people back in Jerusalem outlined in places like Isaiah 2: 1 – 5 and Isaiah 62 and others, is there any wonder that the final battle will take place in Armageddon just north of Jerusalem as also the book of revelation explains? In this last book of the Bible it explains how the demonic forces will go out to assemble against Israel for "the battle on the great day of the Almighty." Anyone who seriously prays for the peace of Jerusalem quickly becomes very aware of the demonic forces that deceive the nations today to turn against the Jewish people and their God given right to their land. May God keep you in His perfect Shalom!